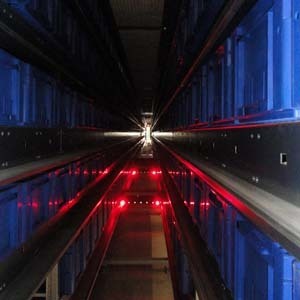 In response to industry requirements for material handling solutions which improve warehouse productivity, efficiency, accuracy and speed while reducing costs, space and carbon footprint, Swisslog launched its new SmartCarrier warehousing and transport system. Swisslog, the global supplier of integrated logistics solutions for warehouses and distribution centres, has followed a consistent strategy of offering customers a complete range of technologies. Its comprehensive portfolio of light goods subsystems, pallet conveyance and storage technology, together with software solutions, offers the ideal basis for this strategy. Swisslog is pleased to launch SmartCarrier as the latest product in its extensive portfolio. At the heart of this new technology are autonomous vehicles (SmartCarriers) which have their own on-board intelligence, making central control of the vehicles unnecessary. Swisslog's innovative SmartCarrier transport and storage system for totes is designed for highly dynamic stock management applications. It consists of three components; a racking system, a high-speed double lift, and autonomous robotic Carriers. SmartCarrier's racking system consists of simple shelving and storage locations, integrated into the vehicle transportation track. The system is able to manage entirely without any power supply system since the Carriers are equipped with the latest maintenance free energy storage facilities on board. The high speed double lift has a lift carriage which can accommodate two Carriers at the same time. The hourly performance of each lift is up to 400 store inputs and retrievals. At the heart of SmartCarrier are the autonomous vehicles, each equipped with their own on-board intelligence, which can not only manage tote storage and retrieval in the stores with a very high throughput rate, but can also transport them around the warehouse or production line. A central controller for the vehicles is no longer necessary. When a Carrier receives an order, it processes it autonomously. Without using a route plan but with knowledge of its own location and that of other vehicles, it orientates itself independently and always finds the fastest path to its destination. The local intelligence of a Carrier links together all areas and all other vehicles without any interfaces. Thanks to their low weight, the autonomous vehicles can be easily transferred between levels in the warehouse. This ensures that they are efficiently deployed in multi-tiered storage facilities.Â It is naturally possible to deploy several vehicles on one level in the warehouse should throughput demand it. The SmartCarrier system is based upon a modular concept which enables system performance to be met by varying the number of vehicles. It can therefore be easily modified for each customer's particular requirements. If one vehicle fails, the others can continue to perform their work independently of the problem and find different routes. This increases the system's inherent redundancy and increases availability, maintaining time to complete the orders.Â If a vehicle should need maintenance, its light weight of approximately 15kg allows it to be removed by a single person, without tools or lifting devices.Â SmartCarrier's biggest benefits to customers include its high system availability, adaptable throughput and ease of expansion. SmartCarrier was conceived for use in production logistics where it has been successfully used for seven years at a number of customer sites including that of a major European car manufacturer, where it had to prove its reliability and performance. The experience and knowledge gained from this application are now being transferred into distribution logistics. Regardless of whether SmartCarrier is used for fast and reliable picking, high-performance stock consolidation or for use on production lines, its applications for tote and bin storage and handling are virtually unlimited. It is possible to deliver product to manual picking stations, manual or automated palletisation stations, production lines or despatch docks, in sequence and just-in-time. The value of smart energy saving designs is becoming ever more significant.Â Rising energy costs and the promotion of energy responsible strategies are becoming more important. Swisslog recognises their obligation to reduce the energy consumption of their automated solutions. In developing new systems and products, Swisslog are mindful that they must deliver clever designs to minimise energy consumption and in turn minimise running costs. The low weight of the Carrier vehicles makes the application very energy efficient, and because the vehicles have an excellent ratio of payload to tare weight this design is more cost effective than more conventional solutions. Carriers are equipped with energy recovery drives which, allied to intelligent energy management, results in a system with comparably low energy consumption. Maintenance costs for the vehicles are significantly lower than that of comparable systems due to the reduction of service components and the simplicity of accessing the vehicles. Maintenance operations can always be carried out without shutting down the system. Swisslog is committed to reducing energy usage and has developed the â€œGreenLogâ€ concept, which supports consistent strategies employing weight optimisation, smart equipment usage and the use of energy-efficient drives throughout its product range. SmartCarrier is one example of this technology. â€œGreenlogâ€ guarantees that the energy consumption of technology and products used in a solution has been optimally reduced. This includes not only the energy requirements of the individual systems and subsystems but also the plant as a whole, to enable the integrated system to deliver energy efficient operation.Â Unnecessary operations like housekeeping and load-free return travels are minimised, allowing the consumed energy to be used to deliver only the performance. Diversifying product ranges and the need to fulfil orders rapidly means warehouses employing stocked items in bin storage are becoming more prevalent in retail, pharmaceutical, food and beverage industries. Historically solutions with this approach frequently comprised of a combination of different storage and transport technologies. Because of its flexibility, the SmartCarrier warehousing and transport system opens up completely new possibilities for innovative solutions which go above and beyond a classic warehousing solution. Apart from picking processes, SmartCarrier can also handle the transportation of other items to key functional areas autonomously. There is no longer a need for separate systems to handle occasional deliveries to laboratories, QA areas or even to office areas.Â This releases enormous potential for using the autonomous vehicles for linking together all functional areas of an entire facility.Â The hardest challenge will be when to stop! SmartCarrier is produced by Servus Intralogistik GmbH in Dornbirn/Austria. Servus Intralogistik is a joint-venture between Swisslog and the Austrian Heron group.